Why You Should Choose a Taylor Acoustic Guitar? “With so many models out there that proves to be quality in materials and great function, why do I need to settle for Taylor acoustic guitar?” – you may ask. Well, refer to the excellent reasons below! Imagine this: Walking along the street then a soul-stirring, raging melody from a guitar suddenly made you pause for a while. For many, the sound of an acoustic guitar appeals a sense of romance and mystery. No wonder, it has been one of the favorite musical instruments of many singers. And, the Taylor acoustic guitar is no exception. Taylor guitars boast a more modern sound, typically very eloquent, crisp, and stable. For the past years, it has grown so much to be one of the most popular and leading acoustic guitar brands around the world along with Gibson and Martin. Celebrities like John Petrucci and Taylor Swift turned to this acoustic guitar to help them produce the best sound their audience deserves to hear. You can buy Taylor Guitars online in Canada. Here, we have listed some great reasons why Taylor acoustic guitar should be included in your next shopping list for a musical instrument. If you want to make best use of your guitar instrument, Taylor guitars are a good option as it crafted with top-quality, superior tonewoods. Above all, it is ideal for players who need a premium quality workhorse that guarantees long-term use. When it comes to aesthetic appeal, this acoustic guitar is not left behind. As have mentioned, it is made out of tonewoods making it good-looking. You’ll surely be pleased having one in your collection. Again, acoustic guitars that are Taylor-made come in various forms, sizes, and shapes to accommodate any playing comfort and style. It will allow you to increase your comfort through ergonomic cutaways and curtail in size. If you travel a lot and need to bring the acoustic guitar with you, the Taylor won’t fail. It has a wide selection of travel-sized acoustic guitars that have a small scale design but ensures the big sound still remains. You can try the Taylor GS Mini or Taylor BBT Big Baby. Taylor promotes the sustainable utilization of tonewoods. It works with local communities and environmental groups globally to build revolutionary programs that our environment will definitely love. Taylor’s guitars are known to have the most playable neck in the industry. All of the guitar necks have been produced for a higher level of comfort and playability. Better tonal experience is also assured. All of the acoustic guitars made by Taylor have been designed with thorough attention to detail. This means, choosing the most resonant wood ‘flavors’. Taylor doesn’t only pick out international tonewoods but also choose the most visually appealing and functional ones. With this acoustic guitar, you no longer need to experience the struggle of finding a pickup that delivers the guitar’s tonality – we should give credit to the ES or Expression System pickup. Unlike other guitars, Taylor has no expiration date when it comes to the sound quality of its guitars. This is due to the tonewoods’ superb quality but light finishing process. Even when used for ten years, you can still expect the same quality of sound as the first time you bought it. Ask some musicians or guitarists on what their favorite acoustic band is, and many would surely tell you its Taylor acoustic guitars. I have no doubt or question about that because even popular singers rely on this instrumental piece. Although a bit expensive, Taylor acoustic guitars can prove it is worthy of your hard earned dollars. Each item has been built with precision and made use of laser-cutting, computer-controlled milling, and other industry-leading processes. In Canada, you can get some good Black Friday deals on guitars. Taking everything into account, there is very little to find mistakes with when you opt for a Taylor acoustic guitar, and it is very easy to see why it is full of admiration by many users. So, get yours now before the stock runs out! Doesn’t it feel like summer just started? We collectively blinked and – bam! – it’s time to get ready to go back to school. And that means it’s time for back-to-school shopping. You want to make sure your kids are prepped for their best possible year. As you pick up pencils and backpacks, you might want to grab some other supplies, too. Creating a homework space in your home can help your kids thrive during this school year. A homework space might not seem that crucial. Many teens love to flop down on the couch with their laptops, and smaller kids are often happiest working on the floor. But think about it: If you worked from home, would you want to be constantly seeking out new spaces to foster productivity, or would you want a dedicated area for your work? Your kids probably aren’t all that different. By carving out a part of the home that’s theirs for getting work done, you allow them to take ownership of their homework (and maybe even find ways to enjoy it). So, without further ado, here are six tips for creating a homework space before the academic year kicks off. Apply this real estate principle to your own home for a more successful homework area. You don’t want to put your young kids’ desks on the opposite end of the house and find yourself running back and forth while preparing dinner. On the other hand, as your kids age, they might enjoy more autonomy. You know your kids best. Think through their personality types when choosing a spot for the homework zone. You wouldn’t like going to a cold, fluorescent-lit office for work. Why should your kids be any different? Create a space they’ll enjoy spending time in and they’re more likely to use it – and actually get some homework done there. Make sure there’s plenty of light. Add pillows or throws so they can cozy up. Let them fill the space with things they love, from art and posters to their favorite books. Your kids probably don’t think homework is very cool. If you can create a cool space in which they can do it, you just might encourage them to stay on top of things. It’s important to leave room for a large clock and calendar. If your kids are old enough, encourage them to fill their calendar with upcoming field trips, events, due dates and tests. Seeing everything they’ve got coming up can help them stay motivated. Isn’t it funny how important pieces of paper have a way of evaporating between school and your front door? You can’t avoid this entirely, but you can help your kids implement a system that makes it easier to get key papers into your hands. Set up their homework area with an inbox. This should be an actual tray into which they can put permission slips, report cards and important documents. That way, when the teacher hands them something, they can picture its journey from Point A (that moment) to Point B (their inbox). Like any work, homework is exhausting if you don’t feel like you have something to show for it. When creating a homework space, prominently feature a gallery area. Use this to post art, awards, fun pictures from school and good report cards. Kids don’t get a paycheck to keep them motivated week in and week out. A visual reminder of schoolwork’s positive outcomes can help them stay engaged and productive. When you read articles about organizing your home, you’ll be hard-pressed to find one that doesn’t feature bins and drawer organizers. Bins aren’t a one-size-fits-all organization solution, but we do think they’re great for kids. Younger humans tend to “just throw stuff” somewhere. If they can just throw it into the bin where it actually belongs, you’ll have a much higher rate of success with keeping the homework area organized. Searching for extra inspiration for what your homework area will actually look like? Don’t worry; we’ve got plenty for you. Here’s a roundup of some great study areas to get your ideas flowing when creating a homework space in your own home. The post Get Back-to-School Ready! 6 Tips for Creating a Homework Space appeared first on Freshome.com. Apartment hunting, especially online, is easy – maybe a little bit too easy. While the internet and print ads can be great sources for connecting people with housing that fits their needs, they can also be a breeding ground for scammers who are looking to take your hard-earned money. Read on to learn about some of the biggest apartment hunting red flags and how to keep yourself safe. One of the biggest apartment hunting red flags is an uncommunicative landlord. Let’s say, for instance, you’ve finally found a property you like. You’ve been calling and calling to try and set up a viewing, but you’ve only been getting the property manager’s voicemail. Worse yet, no call back and it’s been days. Unfortunately, if this scenario sounds all too familiar, it may be time to let go of that apartment and to find one where management is a bit more responsive. The bottom line is: The response you get now is indicative of the response you’ll get later. If you can’t get a response back now – when you’re trying to determine if you’d like to pay rent for this apartment – then when will you? Just imagine what the response rate will be if something goes wrong. Good landlords always get in touch, even if they’re busy. Maybe the paint is clearly chipping everywhere or the trash is overflowing. Every building will have its imperfections, but sometimes there are just too many for the apartment to make sense. As you walk through the building, make note of these little imperfections and see if they add up. Sometimes, all together, they indicate that the apartment isn’t properly maintained. The truth is, if the landlord or maintenance staff aren’t taking care of the little things, they probably aren’t taking care of the big ones, either. Plus, small problems often grow into larger ones. Tiny leaks left unmanaged can mean big floods. Excess trash can lead to infestations. None of which you want in your new home. We’re not saying that cheap rent is a bad thing, especially if you’re short on cash, but there’s a difference between cheap and unrealistic. Sometimes scammers will take existing apartment listings and post them elsewhere at a much cheaper price to collect a deposit from unsuspecting apartment hunters who are excited about scoring a deal. Do your homework in order to make sure that you don’t fall for this dirty trick. Look at lots of apartment listings in your new area so that you become familiar with the going rates. Always go see the unit in person before exchanging any money, even if you’re moving from far away. At the very least, settle for a video tour. Usually, these insistences are enough to scare the scammers away. Yes, you’ll likely have to put up some money for the first month’s rent and security. However, if there’s a push for you to pay in cash rather than by check, it could be a sign that you’re about to get scammed. Always ask for your payment options and, if the landlord or property manager strongly insists on an all-cash transaction, proceed with caution. If you do decide to go through with it, make sure that you have seen the apartment in-person and that you have the signed and completed lease documents in hand. Even though having these things won’t totally protect you, it can give you some legal recourse in the event that the “landlord” is up to no good. Have you been apartment hunting recently? What apartment hunting red flags have you found that are worth sharing? Let us know in the comments. When designing a new home, it’s all about the details. While you’ll be busy picking out things like cabinets and wall treatments, it pays to think small. Even if you’re on a tight budget, there are little design luxuries that almost any homeowner can afford. You might even find that those details are some of your favorite features. Whether you’re into entertaining or you’re devoted to your dogs, some of these affordable design luxuries could make all the difference in your home. A pot filler or secondary sink. Depending on your kitchen layout, water might not always be where you need it. Streamline food prep by installing a pot filler over your stove or consider a secondary, smaller sink (sometimes called a prep sink) on an island. Either one will take about $200 to $300 out of your kitchen budget, but they’ll pay you back in spades when it comes to making cooking easier. A hidden pantry. Finally getting the pantry of your dreams? Consider designing a hidden pantry to preserve the flow of your kitchen. Hidden pantries simply require panels that mimic the look of your cabinet doors. With a cabinet facade, your pantry blends in and your kitchen stays chic. Built-in utensil organizers. Why not make things a little easier on yourself by installing utensil organizers in your cabinets? 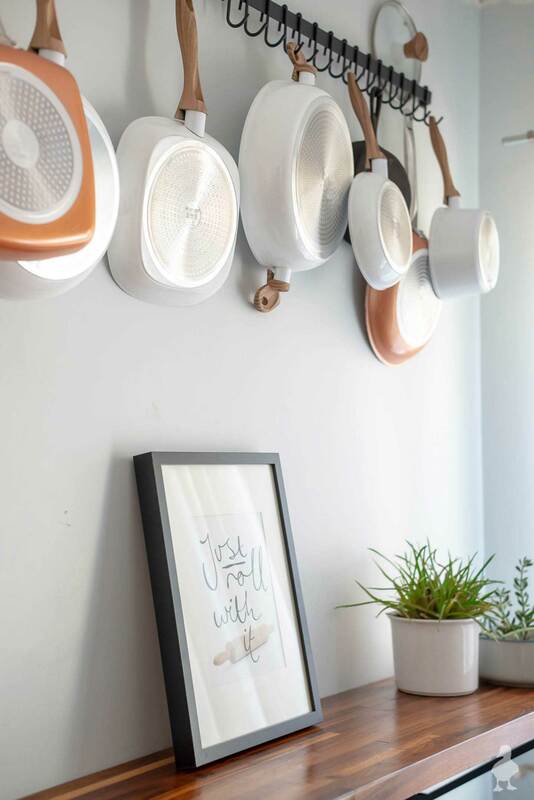 A few thoughtful dividers, hooks and trays is all it takes to upgrade your kitchen into a functional entertaining space. Family homes might wear and tear a little quicker, but they’re packed with love. By designing with kids and family in mind, you can create a space that is welcoming, convenient and built to last. Consider these kid-centric design luxuries. A drinking fountain. Tired of washing cups after a day of play? Drinking fountains are becoming more and more popular in homes, especially in spaces like mudrooms. A small drinking fountain can be installed for under $300, while larger models run $500 to $1,000. It’s a super convenient way to make sure your kids stay hydrated without resigning yourself to hours at the kitchen sink. A message/homework center. Even if your kids have desks in their rooms or a designated homework space, there’s a good chance they’ll end up dragging their books into the kitchen. Setting up a homework center near all the action helps you keep things organized in one space. A nook with a desk, computer and hanging file folders won’t add much to your budget, but can help keep kids motivated and organized. A stair slide. Be your kids’ hero by installing a stair slide. For less than $100, a stair slide can make going down the stairs (even just into the basement) fun for kids. It’s an option that seriously increases the “cool” factor of your home on the cheap. Dogs are like family, so why not add a few little design luxuries that make your home even more pooch-friendly? Dog baths. One of the biggest design trends in 2018 is including a dog bath for keeping your canine clean. After all, there’s nothing worse than a dog tracking mud through your new home. A simple, tiled area with a faucet can make all the difference near your back door or in the mudroom. The extra tile and plumbing is a relatively low cost, and you can use the bath for cleaning off messy kids, spraying off yard tools and a bevy of other housecleaning tasks. Built-in kennels. If you kennel your dog, you know that kennels can be expensive and, let’s face it, kind of ugly. Instead of trying to hide them, make kennels part of the decor by opting for built-in models. You can position kennels so they’re near a dog door, letting your pup roam outside while still offering a dry spot inside. You can even design built-kennels that mimic the style of your woodwork and cabinets, putting up your pooch in style and making your life easier in the process. The main benefit of designing your home is getting exactly what you want. But what might be seen as design luxuries could be extremely pragmatic for the way you live your life. Think outside of the box to come up with thoughtful design solutions that make your home completely unique – and extra luxurious. Will you be incorporating any design luxuries into your next home? Do you have aging relatives or are you thinking of designing a home that you want to live in forever? Then you may have heard the term Universal Design. But it’s hardly just a building and interior design buzzword. It’s a whole way of looking at a home’s design to plan for long-term use and accessibility. It helps people living in the home age in place or manage reduced mobility for other reasons. That means everything from taking care of the small details like adding good lighting to larger whole design concepts like keeping everything on one level of the home to reduce mobility issues. Read on to learn more about Universal Design and how it applies to the home design process. The first step to making a home acceptable for Universal Design is to make sure the home floor plan itself is maximized for accessibility. As mentioned above, that means single-story living so that stairs do not become a barrier to mobility. Open floor plans can also keep areas more easily accessible. The doorways will also be designed wider to make room for wheelchairs, as well as moving larger items around the home more easily. Along the same lines, hallways need to be wider for easier wheelchair mobility from room to room. There should be plenty of turning space around alcoves and doors. In general, Universal Design asks designers to pay more attention to providing as much floor space as possible for ease of wheelchairs in the space. Cramped bedrooms with little space around the bed are a no go. Entries must also not have steps, and thresholds need to be flush with the floor so wheelchairs can move more easily across entryways and between rooms. Universal Designers also give the bathroom special attention. Non-slip surfaces in the bathroom are key. Handrails may go by the shower area and toilet for greater access and stability. Also, designers take ease of use into account when installing showers. For instance, a shower space may just be a tile and drain system. There may be no surrounding steps or tubs of any kind so people can access the space much more easily. Or the space may have a step-in tub with a side that slides up and down. Other smaller details can also make the home easier to navigate. For instance, Universal Design pays attention to good, quality lighting. All spaces may be well-lit with recessed lighting, task lighting or ceiling fixtures. This can help people with poor vision move about the space more easily. Similarly, buttons and other controls that can be detected and controlled by touch or auditory output may be added. Door handles may be a lever design and light switches may be a rocker-type switch. These styles can help people with less hand strength open doors and turn off lights. That’s because they are easier to push on, even with an elbow, than traditional switches and doorknobs. Even smaller details can make the home more accessible. For instance, Universal Design may turn to a single-hand, closed-fist operation for parts of the home like fire alarm pulls. Are you considering incorporating Universal Design into your next home? Wood is a common material for kitchens, from cabinets to walls to countertops. You can also use wood textures in the kitchen in surprising ways to create some visual interest and a style all your own. You can use wood in unexpected ways or in unexpected places to make a statement in a space. So if you’re looking for something creative to do with a kitchen design, take a look at the different ways to use wood textures in the kitchen. One idea is to take a highly distinctive wood texture and use it in unexpected places with high contrast. The photo above shows how the warm, textured wood from the island was also used over the cooktop area. This wood contrasts with the sleek gray cabinetry. Using a certain kind of wood for the island and extending it to other areas of the room creates design cohesion in the space. You can use this idea in a variety of ways. You could use the wood texture in the flooring to line the cabinets, for instance. Or you could use the wood texture in the chairs on the countertops. You can get as creative as you want with this idea. In the photo above, we see another example of how to use wood to create an appealing contrast against cabinets. The sleek, gray cabinets look almost futuristic and the range hood style adds to the modern look, but the warm wood creates a sort of natural feel. What results is some subtle contrast using wood textures in the kitchen, helping the kitchen feel modern but not stark. The naturally textured stone countertop is serves as a nice dividing line between the modern and classic styles. The countertop has the sleek lines of updated styles but the natural stone makes it look slightly rustic. It serves as the unifying point in the style. There are so many wood textures out there, you can also stick to wood alone to create a contrasting style. The style in the photo above contrasts highly textured darker barn wood walls against a lighter ceiling and floor. You can see further contrast in the stainless steel refrigerator and appliances, giving this rustic space a modern touch. A blue and gray color scheme on the cabinets and kitchen area itself also juxtaposes with the surrounding natural wood. It goes to show that if you want to use wood textures in the kitchen in surprising ways, think high contrast. What is abstract wood, exactly? The photo above shows the style on the drawers and island. Wood isn’t typically that gray, nor is it textured exactly like that. But the style still evokes a feeling of a wood texture. When paired with the bright orange minimalistic cabinets, high-gloss white backsplash and black wire chair, you have a thoroughly modern space while still being able to evoke warmth. You can also get a style like this by using an exterior addition like a kitchen cabinet vinyl wrap. Another idea for using unexpected wood textures in the kitchen is to go as natural as you possibly can. The photo above shows a countertop that looks like the wood was just dragged right out of the forest and thrown onto the kitchen island. When combined with the sleek white design of the rest of the kitchen, it’s another interesting high-contrast style. Warm wood floors stop the countertop from looking too out of place. You could use similar highly rustic textures in other countertop spaces or in chairs and stools, too. Happy Friday, friends! The kitchen nook area got a nice little update this week with a new set of pans and a wall-mounted pot rack. The last time I posted about this area was around this time of year in 2016. It seldom gets any love because it’s the spot right before the sliding glass door (aka, the dumping ground for all of the tools and supplies while I work on the shed and deck outside). It looks even better though when you compare it to how it looked the first year I moved in! Funny how we just need the proper motivation to get organized sometimes, right? For me, the trigger to clean up this area was that white cookware set. I found them at TJMaxx and was immediately drawn to the white enamel and faux-wood handles. K and I discovered the first pair of pans while trying to kill a little time before meeting my parents for dinner one night, and we went on a hunt to Homegoods and another TJMaxx for the rest. UDH tip: I assume it’s common knowledge, but just in case you didn’t know: if you find something at TJMaxx or Homegoods or Marshalls but it doesn’t have a full set, you can often find matching items at the other nearby stores. You have to take a little bit of a gamble on it, but I was pretty confident we would find more pans (given how many duplicates we found of the pans we bought). And if you’re interested on these kids of shopping tips, I have more here and here. Anyway, the purchase of the pans made me finally buy the pot racks, and not having any room in my kitchen cabinets for either finally made me go through my pots and pans and get rid of some old ones. After K moved in this year, there’s been a lot of re-organizing to either get rid of duplicates, make room for his collections (he’s got a few, so it’s a challenge! ), or just buy new sets of things to better match our combined tastes. And speaking of reorganizing, the “please stand by” is in regard to me moving servers for this site. That isn’t really going to change how things look, but rather just trying to get a lot of technical stuff dealt with behind-the-scenes so I can then make more improvements. So, if you see something funky over the next couple days/weeks, there’s a good chance I’m already aware of it and trying to fix it, but still feel free to let me know. Whenever migrating, there are things that sometimes disappear (like even this post, so I have held off on my next deck update until I know for SURE I won’t have to do that work twice)! Whether you’re designing a garden from scratch or trying to figure out ways to make your current garden more attractive, you might want to consider looking at garden edging ideas. Garden edging is not mandatory. Plenty of gorgeous garden spaces simply sit right next to the lawn. But adding garden edging helps create a visual barrier between the garden and other spaces. It creates a certain visual logic in your yard. Functionally, lining a garden has its benefits; it can stop the plants from growing outside of their designated space. You can see several garden edging ideas below. This no-fuss, functional idea creates some geometry in the space. As the photo above shows, stone makes a solid visual barrier separating the shrubbery from the rest of the lawn. It also shows how you can add geometric art to the style to further visually separate the space, as in the boxy brown features. It’s an easy design in that it’s not difficult to line a garden or shrubbery space with stone. If you use mulch in your bedding, it also helps create a barrier between the grass and the mulch. That way, you’re not getting mulch mixed into the lawn while you try to carefully rake the mulch along the grass line. Another idea for lining gardens is to place brick around the garden spaces themselves. This creates an easy and visually clean barrier. It’s especially useful if you have walking paths between the garden space, like in the design above. This is a good design if you tend to grow a lot of different plants. That way, each patch of dirt can be devoted to one plant. For instance, one patch might have a certain type of flower and another might have ferns. A whole section could be devoted to growing different types of vegetables. This design lends an organizational logic to a landscape. A classic way to designate a garden space is to go for a raised design. This can be helpful for people with bad backs, or anyone else who doesn’t want to spend a lot of time bending over when working in the garden. It’s also a visually appealing way to keep a garden organized and segmented. The photo above shows some of the attractive designs a raised garden can make, like the star design in the middle of the space. Raised, segmented gardens are another good way to designate different spaces for a certain vegetable or herb. Keeping to a textured wood helps the space look natural and rustic. Yet another attractive way to make garden edging is to go for a brick pathway design. A raised stone pattern on the edge of the path visually separates the path from the garden. And by choosing a tight brick design, you virtually eliminate the chance of weeds and other plants growing out into the pathway, as tends to happen in graveled areas. Brick paths are a good design if you like to spend time strolling in your garden, as you can create as many winding pathways as your space can accommodate. And it’s another nice way to create patches of dirt that can be devoted to certain plant themes, if you wish. You can also use some rustic stone as garden edging. The photo above shows how rough-cut stones set next to each other create an easy, natural garden lining. This design is a good way to create a barrier around a rustic gravel pathway because it helps the look keep to a more natural design. As the photo above shows, this type of stone edging works well in spaces where the plant life is arranged to make it look like it’s more dense, free-growing and natural. If you don’t want a garden that looks too boxy and pre-planned, this is your design. In fact, it’s probably one of the most natural garden edging ideas. How will you use garden edging to give your outdoor space new life? Merriam-Webster describes Zen as “a state of calm attentiveness in which one’s actions are guided by intuition rather than by conscious effort.” From a colloquial standpoint in the West, we generally use it to describe anything that is calm, serene, simple and soothing, especially when it comes to interior design. Zen spaces are also usually defined by distinctly Japanese design aesthetics, like rock gardens and tatami mat floors. If you love everything Zen, you may be searching for ways incorporate Zen in the central spaces of your home. Read on to learn how to get a Zen living room. When people think Zen, they usually think of Zen gardens. But don’t assume that just because it has the word garden in it, it needs to be outdoors. The unique living space in the photo above puts a Zen garden right in the home. Since Zen gardens are usually made up of sand, stone or gravel, they’re easy to put indoors because they don’t have the upkeep of natural plant life. Your Zen garden can also be for more than show: You can also meditatively rake the Zen garden no matter what the weather looks like outside. Zen itself is grounded in a type of Buddhism from Japan. Because of this, one of the easiest ways to get a Zen living room is to find a chic representation of the Buddha. Adding this element to a room allows you to create a Zen focal point. How Zen you go from there is entirely up to you. It’s a nice way to add an element of Zen, even if you’re not looking to go drastic with your design plans. Also, choosing a chic artsy figure like in the photo above allows you to keep the space more modern, if that’s the style you’re going for. The above tips suggest ways to incorporate Zen into modern stylings, but Zen also complements rustic spaces, creating a rustic chic vibe. Just take the photo above: Something as simple as the light earth tones gives the space a loose, natural Zen feel. Zen is usually associated with natural elements, so the style pairs well with rustic elements like exposed beams, textured wood flooring and carved art. If possible, combine the style with open views of nature. That creates an even more rustic, natural and soothing Zen vibe. Of course, not all of your Zen features have to be in the living room itself. Simply opening your room into a Zen rock garden or having a window view to one can create that sense of Zen. It’s an easy way to add visual style to the Zen living room without installing a full-fledged Zen garden in your home. This is also a good idea for minimalistic or transitional spaces. The soothing nature of a gravel-based Zen garden pairs well with minimalistic style, and the Zen garden itself is a traditional element that adds interest to a transitional space. Since Zen has its roots in Japan, you may consider using traditional Japanese architectural elements in your living room. The photo above is actually a design from a home in Kyoto. But the traditional tatami floor and paper doors are great sources of inspiration for your own living room design project. If committing to this style makes you nervous, you could choose one or two elements to suggest it. Try installing one paper sliding door. Or place a tatami mat in the middle of the living room. You might also consider other Japanese elements like koi fish or a short-legged table, also called a chabudai. We’ve covered many ways to incorporate Japanese style into your home if you’re craving more inspiration. Remember, the goal of Zen design elements is to add a sense of calm to your living spaces — so try not to stress as you decide how to incorporate it! There are many options for achieving that soothing aesthetic, whether you want to go big or understated. Do any of the ideas above make you want to add a little Zen to your home? We’d love to hear about it below. The post 5 Ways to Get a Zen Living Room appeared first on Freshome.com.